ANDROID P: WHAT’S NEW AND HOW IS DIFFERENT FROM ANDROID O? A preview of every version of Android comes in March for Developers and it is out now for Android P.
Every year, with every new version of Android, the developers introduce new changes. Be it functionality or interface. Over the years, Android has changed the appearance and it has started appealing with every passing year and newer version. The clock’s position has been changed. Now, with the new version of Android, it has shifted to left-hand side top corner of your screen. Settings are no longer boring black and white list. Google has added colors and new icons to it to make it look more attractive. The quick settings notification pulldown panel is simpler than ever. Android P’s dock is highlighted the way it should have been. We take screenshots more often than we notice, with Android P, you can take screenshots with just a Power button. The Volume slider is now smaller and has been repositioned on the right-hand side. WHAT ARE THE CHANGES FROM THE DEVELOPERS POINT OF VIEW? With Android P, your smartphone gets smarter. If an app is running in the background and not active, it won’t be able to access microphone, camera, and other sensormanager sensors. Android P will have inbuilt support for more video and image codecs including HEIF (heic), HDR VP9 Profile 2. It also has a multi-camera API so that an Android app can discreetly ask for the data from more than one camera sensor at once. It supports Wi-Fi Round-Trip-Time, which enables apps to get indoor positioning data down to a meter or two. With Android P, you will get better and improved autofill. Enhanced performance for ART and apps written in Kotlin. Changes to improve the power efficiency in Android, including Standby, Doze, and Background Limits. 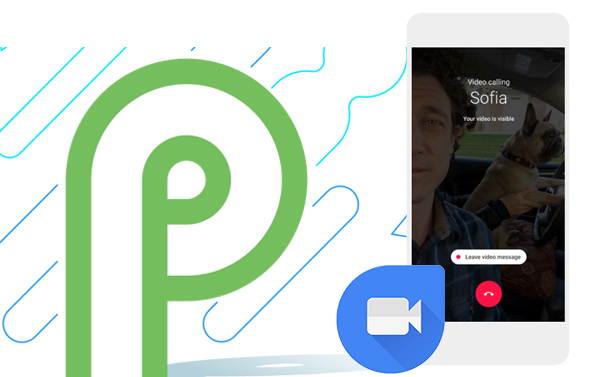 New video messages feature added to Google Duo. Google Duo, an app which has been launched to compete popular FaceTime, gets a new update. With the update, you can send video voice messages instead of voicemails when someone doesn’t pick your phone. According to Google if someone whom you are calling, misses or declines your calls, you can record a video message of up to 30 seconds and send it to the person. You can play the video messages in the Duo app by tapping on the sender’s icon. The receiver can also call you back through “Call now” button available after watching the video message. Say, when you are calling your brother to show him your latest shoes collection, but he is busy to take your call, you can always show them by leaving a video voicemail message. He can call you back with the Call Now button when he has watched the message. Google Duo works on both iOS and Android and this feature will be available from today on both the platforms. WILL IT BE ABLE TO GIVE COMPETITION TO FACETIME? It feels like FaceTime has been there from the beginning of time. Well, not exactly but yes, it has been there long enough to make a significant position when it comes to video calling app. All video messages will vanish one day once you have watched them, although, you can save them to your iPhone’s camera roll if you want to. Google Duo came out in August 2016. To start using the app, users need to sign up with a phone number and can call their friends and family members with Duo installed on their phones. Google Duo has been trying to keep up with FaceTime by introducing new features now and then. Now the time will tell, how successful it will be! Malware & Heists: Blockchain Tech is under ATTACK!